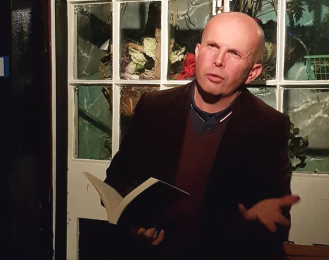 Brighton writer Tom Johnstone launched his new book The Monsters are Due in Madison Square Garden earlier this week at quirky city eaterie, Bom Banes, in Kemptown. The story, set in 1934, focuses on investigative reporter Herb Fry who moves to New York to escape the vengeful Ku Klux Klan. Finding safer work writing on the paranormal, he's in for a shock, the Big Apple's crawling with German American Bund Nazis, jumpy because a horror movie buff with supernatural powers and a taste for elaborate set-piece murders is picking them off one by one. Will Herb ever find out who murdered the love of his life? And how will he survive long enough to interview Bela Lugosi. Tom began writing the novel during the 2016 US presidential election campaign, and the simultaneous rise of the 'Alt-Right'. The parallels between the politics of the 1930s and present day prompted him to weave this tale mixing folklore, early horror cinema and gothic fiction whilst addressing the real-life horrors of economic depression, fascism and war. Tom said: "Whilst writing this, I was struck by how stars of these movies were often outsiders: immigrants and refugees. "Bela Lugosi, who created the most enduring screen persona of Dracula, fled Hungary because his trades union activities made him a target for state reprisals after an uprising there. "Peter Lorre, another popular actor specialising in villains and other creepy types, was a Jew who narrowly escaped Nazi Germany. This idea was the starting point for the novella." Having lived in Brighton for over twenty years, Tom's rarely used it as a setting for his fiction, with some notable exceptions: 'A Helping Hand', his contribution to QueenSpark Book's 'Brighton - The Graphic Novel' set during the 1950s police corruption scandal, 'The Chiromancer', a 'club story' told in an illegal gay club in the '50s (the Regina Club) rather than the traditional gentleman's club, and 'The Beast in the Palace', a kind of twisted fairy tale about the dark side of George IV's lifestyle in the Royal Pavilion, which will appear in the next issue of Black Static magazine." Tom is currently completing the follow-up novella to Madison Square Garden, called Star-Spangled Knuckle-Duster.